Mussels are inexpensive, they cook in five minutes and they taste great – so they are perfect for a weeknight meal. 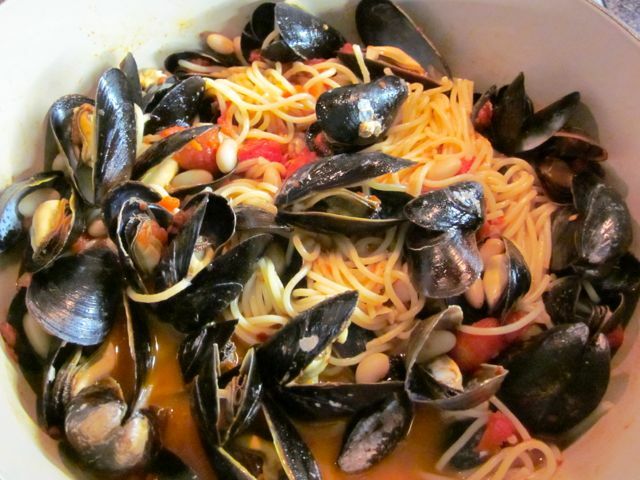 In this recipe from the February 2013 issue of Bon Appetit, tomato sauce, white kidney beans and mussels are combined with cooked pasta to create satisfying meal that is ready in about 30 minutes. When using mussels, be sure to discard any raw mussels with broken or cracked shells and any that don’t fully close when you tap them with your finger. 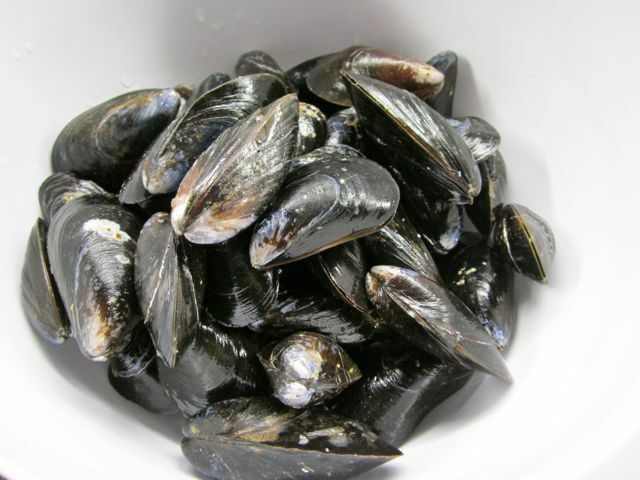 Don’t eat any cooked mussels from shells that don’t fully open. 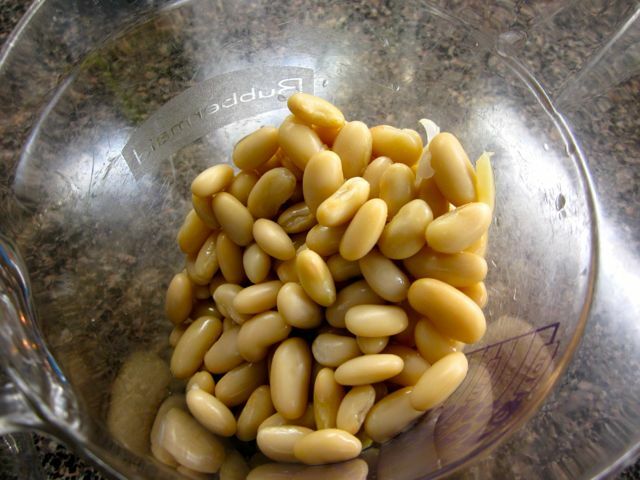 Butter, canned tomatoes and white kidney beans may contain colour, additives or preservatives. Use a butter that has only cream as an ingredient, canned tomatoes with only salt added and canned kidney beans with no preservatives; I used PC Blue Menu brand. 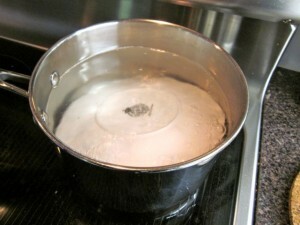 Heat butter and 2 tablespoons oil in a large heavy pot over medium-low heat. 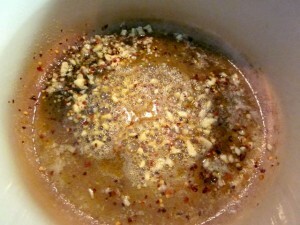 Add garlic and red pepper flakes and cook, stirring often, until beginning to brown, about 2 minutes. Add tomatoes with juices, crushing tomatoes lightly with your hands. Increase heat to medium-high. Cook, stirring often, until sauce thickens, 10-15 minutes. Add beans and wine to sauce. Cook, stirring often, until wine has almost evapor-ated, about 4 minutes. Add mussels and ¼ cup pasta cooking liquid. Cover; cook, stir-ring occasionally, until mussels open, about 4 minutes (discard any that do not open). Add pasta and ¼ cup pasta cooking liquid to mussels and stir to coat. Reduce heat to medium and continue stirring, adding more cooking liquid as needed, until sauce coats pasta. Divide among bowls. Drizzle with oil; garnish with parsley. Serves 6. 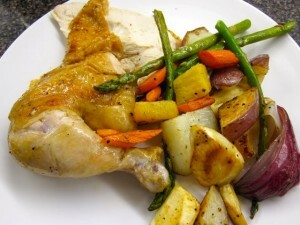 Roast chicken is our favourite Sunday dinner comfort food. 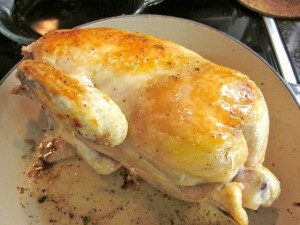 I’m always looking for the “perfect” roast chicken, so I recently tried Julia Child’s classic recipe. It’s a little more labour intensive than most recipes, because you must turn the chicken from one side to another to cook and brown it evenly. But the results are well worth it. The chicken is juicy and the skin is brown and crisp. Served with roasted root vegetables, it’s comfort food at its best. Use butter that contains a single ingredient: cream. 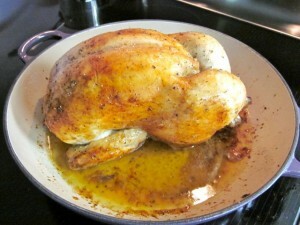 If you are making the gravy, use an all natural chicken stock, such as Imagine brand low-sodium broth. Preheat oven to 425 degrees. Sprinkle the inside of the chicken with ¼ teaspoon salt and smear in half the butter. 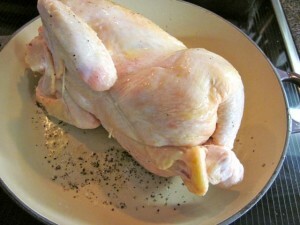 Truss the chicken and dry it thoroughly. Rub the skin with the rest of the butter. 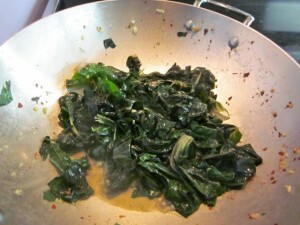 In a small saucepan melt 2 tablespoons butter, and add 1 tablespoon cooking oil. Set aside for basting. 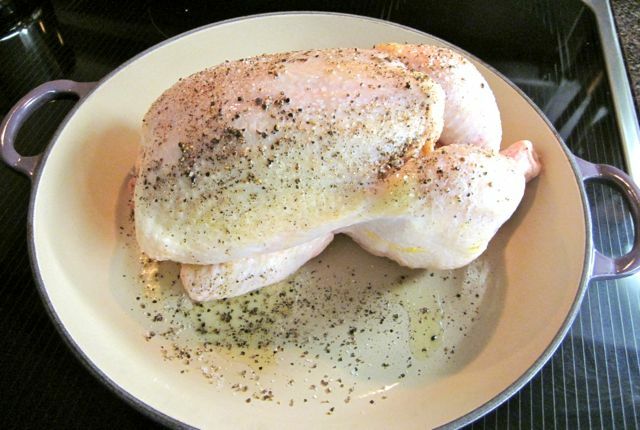 Place the chicken, breast up, in a shallow roasting pan. Strew the vegetables around it and set it on the rack in the middle of the preheated oven. Allow the chicken to brown lightly for 15 minutes, turning it on the left side after 5 minutes, on the right side for the last 5 minutes, and basting it with the butter and oil after each turn. Baste rapidly so the oven does not cool off. Halfway through estimated roasting time (about 40 minutes), salt the chicken with ¼ teaspoon of salt and turn it on its other side. Continue basting. Fifteen minutes before the end of the estimated roasting time, salt again and turn the chicken breast up. Continue basting. When chicken is done, discard trussing strings and set chicken on hot platter. It should sit at room temperature for 5 to 10 minutes before being carved so the juices are absorbed by the meat. Chicken is done when it registers between 175 and 190 degrees, depending on preferred doneness. Remove all but two tablespoons of fat from the pan. Stir in the minced shallot and cook slowly for 1 minute. Add the stock and boil rapidly over high heat, scraping up juices with a wooden spoon and letting it reduce to about ½ cup. Season with salt and pepper. Off heat and just before serving, swirl in the last 1-2 tablespoons butter. Pour a spoonful over chicken and serve the remainder at the table from a sauceboat. Serves 4. Black cod, also known as sablefish, is a cold-water fish that is showing up in many recipes these days because of its white flesh, delicate texture and sweet taste. If you can find it, try it in this recipe. 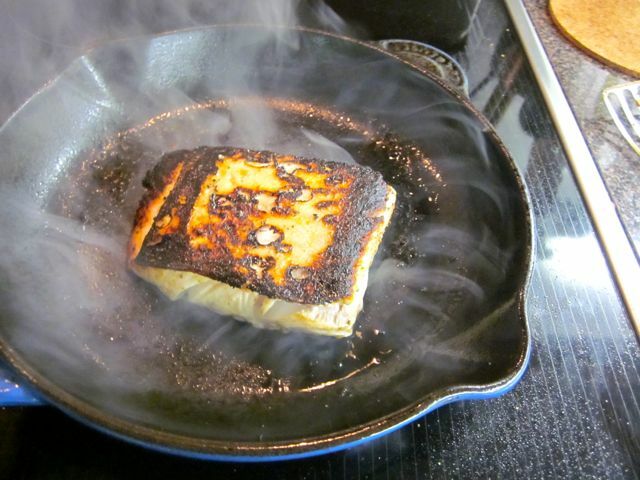 You can also use halibut, which is not as high in fat. 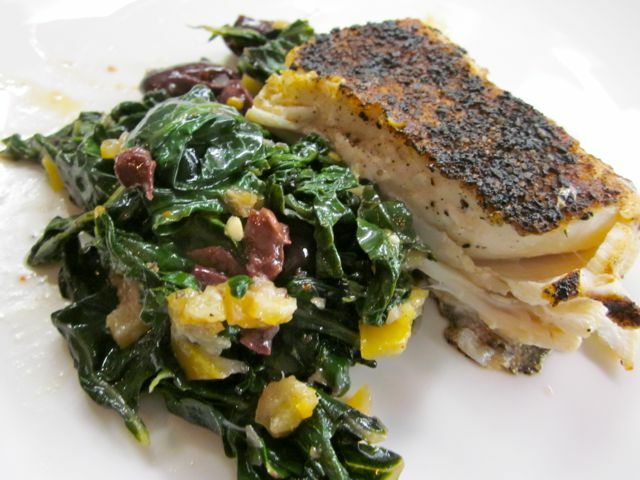 The preparation of the fish in this recipe is straightforward; the interesting ingredients are reserved for the Swiss chard. 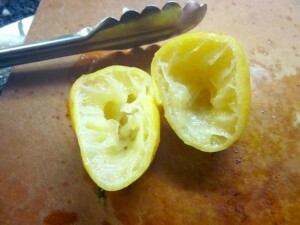 You boil a whole lemon for a half hour until it is tender, then chop the pulp, peel and pith. The chopped lemon is combined with chopped black olives and the mixture is added to the sautéed chard. It’s an unusual flavour mix, but it works very well with the oily fish. This is also a very nutritious, low-fat recipe, with only 220 calories per serving. 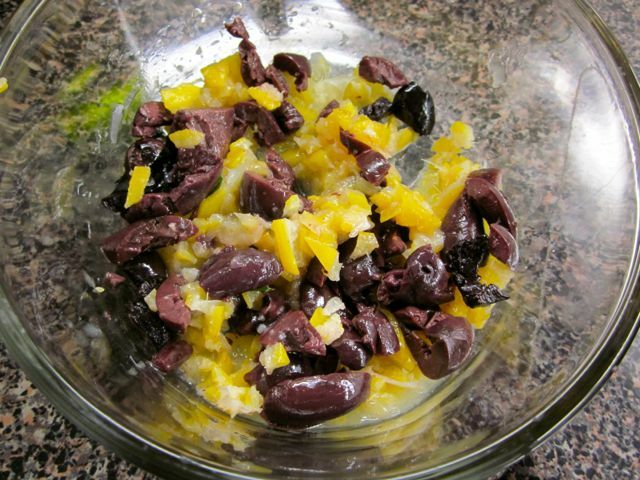 The only thing to watch out for in this recipe are the olives. Look for olives cured in oil without any additives or preservatives. Meanwhile, heat remaining 1 tablespoon oil in a large skillet over medium heat. Add garlic and ¼ teaspoon crushed red pepper flakes; cook, stirring, until fragrant, about 30 seconds. Add chard by the handful, tossing and allowing it to wilt slightly between additions. Season with salt and pepper. Cook, tossing occasionally, until all chard is tender, 5-7 minutes. Set aside. 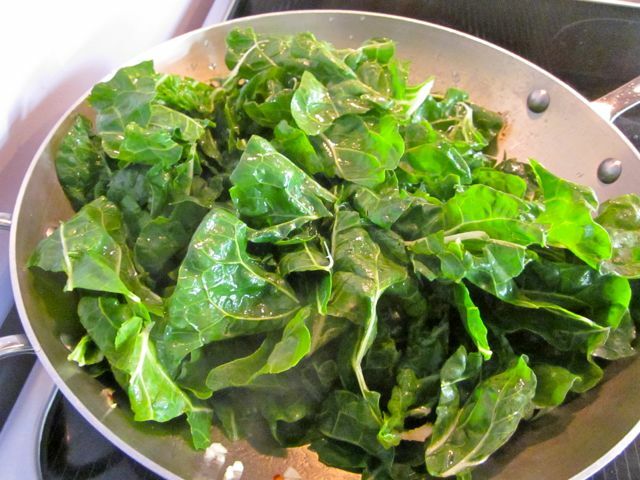 Mix olives and reserved lemon mixture into chard. 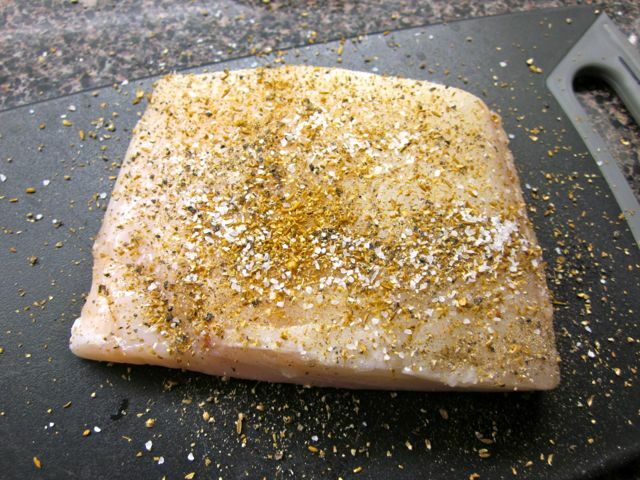 Season with salt, pepper, and more crushed red pepper flakes, if desired. 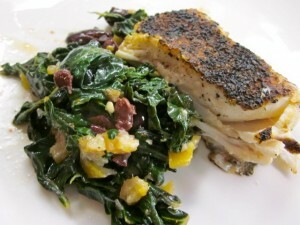 Serve fish with chard. Serves 4. You can make this pork noodle stir fry from the January 2013 issue of Canadian Living as mild or spicy as you like. Once you start cooking, the stir-fry is done in less than 15 minutes, so be sure to have all your ingredients ready to go before you begin. I whirred a pork tenderloin around in my food processor instead of buying pre-ground pork, and that worked very well. I also sliced my own cabbage, instead of buying coleslaw mix. You could add any vegetables you have on hand to this dish. Soy sauce, chili garlic paste, rice vinegar and sesame oil can contain artificial ingredients. 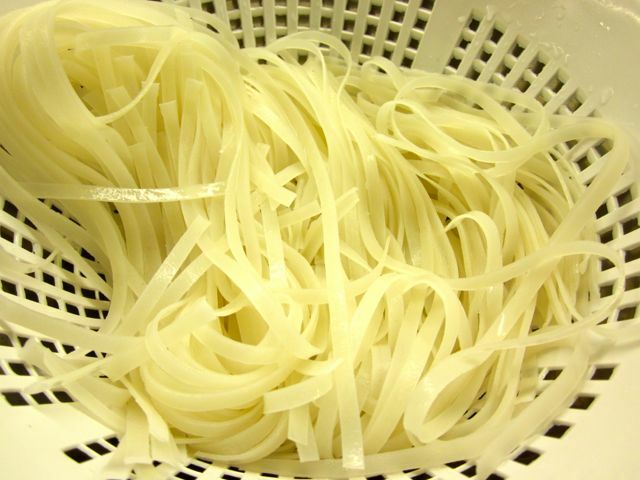 Instead of soy sauce, try tamari, which is preserved with alcohol instead of sodium benzoate. I used Tabasco brand hot sauce instead of chili garlic paste. Marukan light seasoned rice vinegar and Eden toasted sesame oil are both additive free. In large bowl, soak vermicelli in warm water until softened and separated, about 5 minutes. Drain and set aside. Meanwhile, whisk together soy sauce, chili paste, vinegar, sugar, sesame oil, salt and 2/3 cup (150 mL) water; set aside. 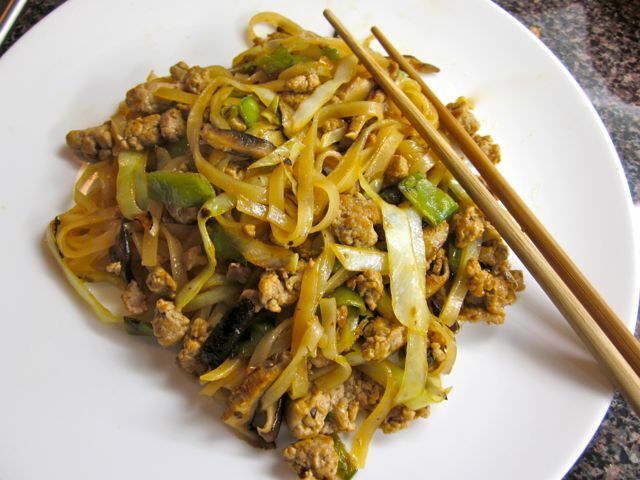 In wok or large skillet over medium-high heat, cook pork, stirring occasionally and breaking up with back of wooden spoon, until browned, about 5 minutes. 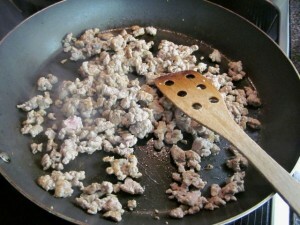 With slotted spoon, remove pork to plate. Drain and set aside. Wipe wok clean and return to heat. 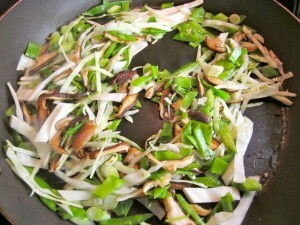 Add vegetable oil and mushrooms; cook, stirring occasionally, until mushrooms begin to soften, about 2 minutes. 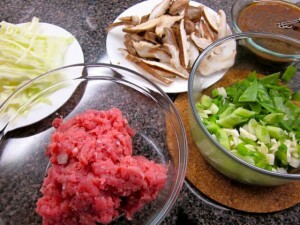 Add coleslaw mix, snow peas, green onions and garlic; stir-fry for 2 minutes. 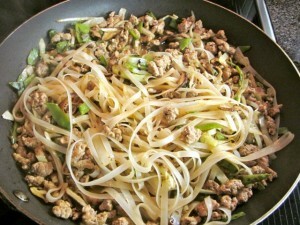 Stir in soy sauce mixture and noodles, tossing to combine; stir-fry until tender, about 3 minutes. Sprinkle with peanuts. Eye for a Recipe is powered by	WordPress 2.9.2 and delivered to you in 0.276 seconds using 32 queries.